as promised, this is the blog containing Michael's total numbers so far this year. not everyone is curious about a baseball player's statistics within a month, i get that, but most fans are typically interested in current overall numbers, and that is why i now will be writing two blogs at the end of every month. these types of posts feature Michael's 2017 regular season numbers up to the point in the year that we're at. this particular blog covers April 3 to May 31. the format is the same as in my monthlies, except certain sections have been eliminated because they're just not all necessary here. the main difference between my two blogs is this: the cumulative season blogs focus solely on Michael's numbers, while the monthlies provide stats as well as detailed information that i feel is important to document in regards to each month. now let's get into Michael's 2017 #s through May! Michael's .300 batting average is currently the highest on the team out of all the qualifying players. 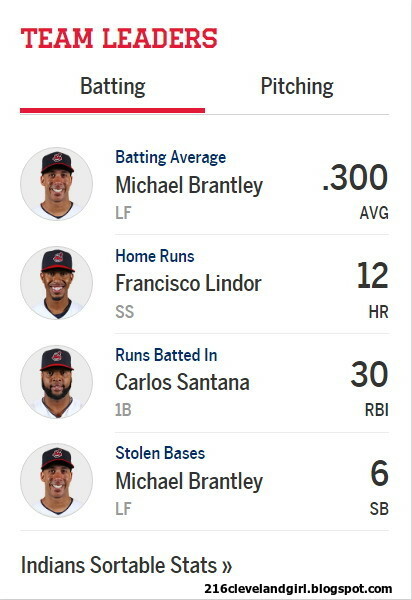 Jose Ramirez, however, is close behind him, batting .293.
through May, Michael leads the team with 6 stolen bases, a .300 batting average, and .367 OBP. he leads the outfielders with 81 putouts, 3 assists, 374.0 innings, and 44 games. Michael is tied for 2nd on the team with 1 intentional walk. in addition, he's 3rd with 51 hits, .441 SLG, and .808 OPS. Michael has a total of five home runs for 2017 so far, the same number he had in April because he did not hit any homers in May. all the extra power i believed Michael had gained while rehabbing from surgeries over the last two years has gone MIA. Michael has not hit a homer since April 30, and how much longer the drought will continue is anyone's guess. the team leader in home runs right now is Francisco Lindor with 12, which is a bit surprising, and Edwin Encarnacion is 2nd with 10. no other Indians player has more than seven. two months into the season, Michael has a total of 22 RBI while leaving 66 men on base. the former is a little too low and the latter is a little too high for my liking, but they both reflect Michael's struggles to hit with runners in scoring position in the month of May. at this time, Carlos Santana leads the team in ribbies with 30. Michael's 22 are tied for the 4th most runs batted in. it's hard to say if he'll be able to hit at a high enough rate in the future in order to ever lead the team in this category, as he's done in previous years. here's an updated HR:RBI ratio. three of Michael's 5 home runs were solo and the other two were 2-run bombs. therefore, 13.6% of his 22 RBI have come from his solo homers, while 31.8% of his 22 RBI have come from all 5 of his home runs. through May, Michael has 47 groundouts, 25 flyouts, 12 lineouts, and 7 pop outs versus 28 strikeouts. he's certainly making more contact with the ball now as opposed to striking out when making an out. that said, i think he's hitting a lot more ground balls than usual and i wish he would start getting more balls up into the air (and out of the ballpark😜). this information can be found in the BOP section of my monthly blogs, but i never included the collective numbers in these blogs. so i finally decided to add a separate section in order to incorporate them here. Michael has reached base a total of 72 times in 2017 via hits, walks, hit by pitches, fielder's choices, throwing errors, and fielding errors. he's scored 22 runs total, 5 of which came from his own home runs. he's been driven in 17 times by other players and left stranded 50 times. i don't expect Michael to score every time he gets on base, but it's evident that the batters behind him have not been doing their jobs very consistently. Michael hit in 35 of the 44 games he's played in so far in 2017 and reached base safely in 39 games. he has 9 hitless games, but still reached base in 4 of those. Michael has 15 multi-hit games, 1 three+ hit game, and 4 multi-RBI games. he has at least 1 RBI in 17 games. in addition, he has 3 go-ahead hits and 4 go-ahead RBI. the Indians are now 26-18 in games that Michael's played in and 1-6 in the games he's sat out/missed. --a modest 6-game hitting streak on the road between April 8-22. it began on April 8, then continued from April 17-22. --a 10-game hitting streak, in which he bat .381 (16-for-42), between April 13-27 (over 15 days). --a 10-game on-base streak between April 13-27. --a 10-game on-base streak on the road between April 7 - May 3. it spanned over April 7-8, April 17-22, and May 1-3. --a 14-game hitting streak, in which he bat .345 (19-for-55), between May 15-30. --a still active 15-game on-base streak between May 15-31. --a still active 18-game reached base streak between May 12-31 (over 20 days). --a still active 15-game reached base streak at home between April 29 - May 31. Michael is currently batting .315 (35-for-111) against right-handed pitchers and .271 (16-for-59) against left-handed pitchers. his average against southpaws decreased because he had an abnormally tough time when facing them in May. i expect these BAs to become more equal, with the latter improving, as the year continues. Michael's hitting .315 (29-for-92) with 13 RBI at home. he has 5 doubles and 3 home runs (8 extra base hits) at Progressive Field, along with 12 runs, 8 walks (1 intentional), 3 stolen bases (2 - 2nd, 1 - 3rd), 4 GIDP, 16 strikeouts (13 swinging, 3 looking), and 43 total bases while playing 23 out of 25 total home games. he hit safely in 19 of the 23 home games he's played in and safely reached base in 21 of them. he has 4 hitless games at home, reaching base in 2. Michael's hitting .282 (22-for-78) with 9 RBI away from Progressive Field. due to a mediocre road performance in May, his overall BA dropped over 30 points from the end of April. he has 4 doubles and 2 home runs (6 extra base hits) on the road, along with 10 runs, 9 walks, 1 hit by pitch, 3 stolen bases (2nd), 1 caught stealing (2nd), 12 strikeouts (11 swinging, 1 looking), and 32 total bases while playing 21 out of 26 total road games. he hit safely in 16 of the 21 road games he's played in and safely reached base in 18 of them. he has 5 hitless games away from home, reaching base in 2. Michael's now batting a lowly .227 (10-for-44) with runners in scoring position with 16 RBI through May. to be more specific, he's batting .250 (3-for-12) with RISP and 0 outs, .231 (3-for-13) with RISP and 1 out, and .211 (4-for-19) with RISP and 2 outs. a serious May skid in which he went 17 straight at bats without a hit with RISP really hurt his average here and robbed him of many more RBI. with 2 outs in an inning, Michael is presently batting .277 (18-for-65). he now has 4 doubles, 1 home run, 6 RBI, 9 walks, and 10 strikeouts (9 swinging, 1 looking). additionally, he's hitting .289 (22-for-76) with 19 RBI with runners on base and N/A (0-for-0) with 1 RBI with the bases loaded so far this season. he only came to the plate once with bases loaded and drew a walk, so he technically does not have a batting average for this category. lastly, Michael's hitting .309 (29-for-94) with the bases empty right now. he has 3 doubles, 3 home runs, 3 RBI, 7 walks, and 18 strikeouts (17 swinging, 1 looking). vs. the Detroit Tigers, Michael's batting .278 (5-for-18) in 5 games--2 of the 3 at home and 3 on the road. (he had 1 scheduled day off during one April home series.) the Indians are 2-3 in the games he's played in and lost the game he did not play in. overall, Michael has 5 singles, 3 runs, 3 walks, 1 stolen base (3rd), 1 first at bat hit, and 5 total bases. he's also grounded into 1 double play, struck out swinging 3 times, and left 9 men on base. furthermore, he has a .381 OBP, .278 SLG, and .659 OPS. defensively, he's played 43 innings/5 complete games in left field and recorded 8 putouts. vs. the Minnesota Twins, Michael's batting .333 (8-for-24) in 6 games--3 on the road and 3 at home. the Indians are 4-2 in the games he's played in. overall, Michael has 6 singles and 2 extra base hits, including 1 double and 1 home run, to go along with 3 RBI, 4 runs, 3 walks, 1 hit by pitch, 3 first at bat hits, and 12 total bases. additionally, he has 2 strikeouts (1 swinging, 1 looking) and 14 runners left stranded. furthermore, he has a .429 OBP, .500 SLG, and .929 OPS. he's played 52 innings in left field, but only 4 complete games because he was subbed out defensively after 8 innings in 1 game in April following getting hit on the right shin, and he was lifted for a pinch runner in the bottom of the 8th inning in 1 game in May. he's also recorded 13 putouts. vs. the Kansas City Royals, Michael's batting .333 (8-for-24) in 6 games--3 on the road and 3 at home. the Indians are 3-3 in the games he's played in. overall, Michael has 8 singles, 2 RBI, 2 runs, 1 walk, 1 stolen base (2nd), 1 first at bat hit, and 8 total bases. besides that, he's grounded into 1 double play, struck out swinging 4 times, and left 7 runners on base. furthermore, he has a .360 OBP, .333 SLG, and .693 OPS. as the left fielder, he's played 47 innings, but only 5 complete games because he left 1 game early in May after 3 innings following spraining his right ankle. he's totaled 12 putouts as well. vs. the Chicago White Sox, Michael's batting .333 (7-for-21) in 5 games--3 at home and 2 of the 3 on the road. (he had 1 scheduled day off during one April road series.) the Indians are 3-2 in the games he's played in and lost the game he did not play in. overall, Michael has 3 singles and 4 extra base hits, including 2 doubles and 2 home runs, as well as 5 RBI, 3 runs, 2 walks (1 intentional), 1 stolen base (2nd), 1 caught stealing (2nd), 3 first at bat hits, and 15 total bases. he also has 6 strikeouts (5 swinging, 1 looking) and 8 men left on base. furthermore, he has a .391 OBP, .714 SLG, and 1.106 OPS. while playing left field, Michael's recorded 11 putouts and 1 assist in 46 innings/5 complete games. the Indians have played a total of six games against two National League teams through May. Michael has played in five of those games. the Indians are 1-4 in the games he's played in and lost the game he did not play in. overall, Michael's batting .235 (4-for-17) in Interleague Play so far in 2017.
vs. the Cincinnati Reds at Great American Ball Park (no designated hitter allowed) and Progressive Field, Michael's batting .273 (3-for-11) in 2 road games and 1 home game in May. (it was initially supposed to be a home-and-home series with 4 total games, but 1 home game was postponed due to rain and will be made up in July.) the Indians are 1-2 in the games he's played in. overall, he has 2 singles, 1 extra base hit--a double, 1 RBI, 2 runs, 3 walks, and 4 total bases. he's also struck out swinging twice and left 4 runners on base. furthermore, he has a .429 OBP, .364 SLG, and .792 OPS. in the field, Michael's played 26 innings/3 complete games in left and recorded 8 putouts. among qualifying left fielders in the American League, Michael's ranked 1st in batting average (.300); tied for 1st in hits (51) and OBP (.367); tied for 2nd in doubles (9) and intentional walks (1); 3rd in OPS (.808); tied for 3rd in singles (37); 4th in SLG (.441); tied for 4th in extra base hits (14) and total bases (75); 5th in stolen bases (6) and at bats (170); tied for 5th in hit by pitches (1) and plate appearances (188); 6th in RBI (22); 7th in walks (17); tied for 7th in home runs (5); and tied for 9th in games played (44). Michael's also ranked 9th out of 11 players in strikeouts (28), meaning he has the 3rd least amount of Ks among AL left fielders right now. among qualifying outfielders in the American League, Michael is 4th in batting average; tied for 5th in singles and OBP; and tied for 10th in hits. besides that, he's 26th out of 31 players in strikeouts. among all qualifying left fielders in the Major Leagues, Michael is 4th in batting average; tied for 4th in hits and intentional walks; tied for 5th in singles and OBP; 6th in stolen bases; 8th in OPS; tied for 8th in doubles, hit by pitches, total bases, and plate appearances; and 9th in at bats and SLG. he's also tied for 18th of 23 players in strikeouts. among all qualifying outfielders in the Major Leagues, Michael ranks 10th in batting average. he additionally ranks tied for 58th out of 66 players in strikeouts. among all qualifying players in the Major Leagues, Michael's strikeouts are tied for 143rd out of 173 players. 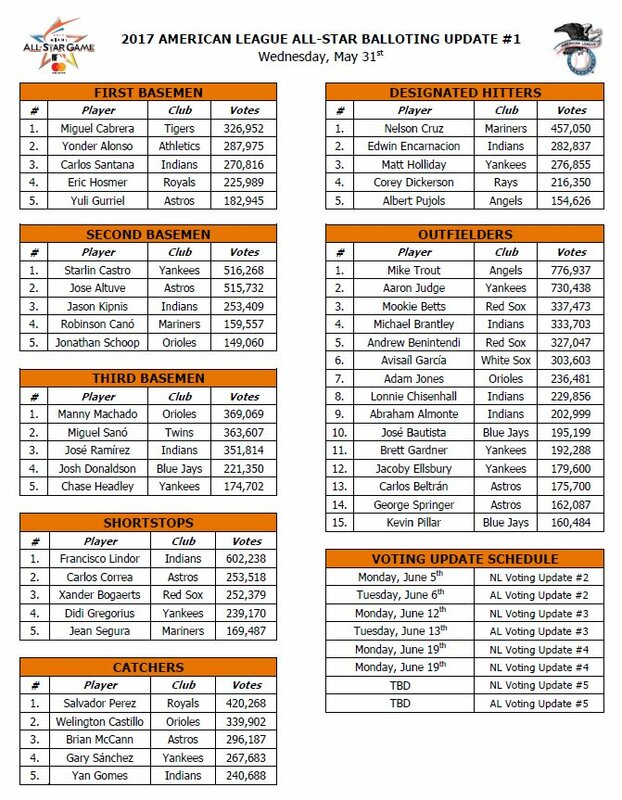 the first American League All Star voting results were released on Wednesday, May 31. Indians fans will be excited to learn that our Tribesmen are everywhere on the ballot, including Michael, who is ranked 4th on the Top 15 outfielders list! he has never ranked this high before, let alone debuted that close to the Top 3. so now it's time to shift our focus to not only getting Michael on the All Star team, but getting him named as a starter! according to the numbers on the chart, Michael is 3,770 votes behind Betts and 6,656 votes ahead of Boston's Andrew Benintendi, who's in 5th place right now. these ranks could easily change within the next week, and certainly will over the next month. so if you haven't used all your votes yet, please do and #VoteSmooth! *Trout is presently on the disabled list with a torn UCL in his left thumb and just had surgery on May 31. he will need approximately 6-8 weeks to recover, likely making him unavailable for the Midsummer Classic. so even though fans are probably still going to vote for him, his injury potentially opens up a starting spot in the outfield. it is unknown at this time how that spot would be filled, whether it would go to the player with the 4th most votes or if the MLB Commissioner would choose the 3rd starter. but if it did go to the player who finishes 4th, then it's imperative for Michael to remain there (if he can't overtake the 2nd or 3rd spot, that is). as for the rest of the voting results, i was shocked to find most of the Tribe's starting lineup in there. i don't know if each position has ever had at least one Indians player in the Top 5 (or Top 15 for OF) in the past. truthfully, there are a few players who made the first ballot that probably shouldn't be on there. no shade, but Abraham Almonte is 9th and he hasn't even acquired enough plate appearances to be a qualifying player. and 8th place Lonnie Chisenhall is also a platoon player with deceptively impressive stats. there have been years when Michael didn't make the Top 15 with more games played and better numbers than those two, so that really tells you something. it would appear as though more Tribe fans decided to vote this year due to the team having made it all the way to Game 7 of the Fall Classic last year. the proof is in the fact that there were NO Indians anywhere on 2016's All Star ballot. it goes to show how fans will support their boys when they come within two runs of winning a championship. the All Star Game is basically a popularity contest, and this year the Indians are finally popular! on the other hand, in this first wave of results, there is a clear drop-off in overall votes. 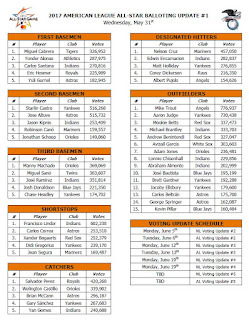 normally, after one month, there's usually at least a couple players with over a million votes. an explanation for that could be that the votes this year are more spread out. or else maybe some baseball fans don't have as much desire to vote anymore since the game no longer determines home field advantage in the World Series. whatever the reason, voting is definitely down at this point. future AL results are scheduled to be revealed on the following Tuesdays: June 6, June 13, and June 20. the 5th set of updates is listed as TBD. (shouldn't it be Tuesday, June 27 though?) voting ends on Thursday, June 29 at 11:59 pm ET, giving you four more weeks to create additional email accounts (😉wink, wink😉) and cast more ballots. keep voting for Michael to get him into the Top 3 so that he can be a starter in the ASG for the first time! VOTE FOR MICHAEL HERE! for what it's worth, Francisco Lindor endorses Michael for the 2017 All Star Game. from a video on the cleveland.com youtube channel, he complimented, "he's as professional as they come. and i enjoy watching him, i learn from him every day and i just, i follow him. i follow him wherever and i ask him questions and ask him what he thinks and pick his brain and learn from him. he's special, he's a special player, but an even better person." "i guarantee you he's not getting votes only for, just cause he's doing good this year. he's getting votes cause he's a good person and he's getting votes cause he's one of the best ones in the league. it's cool. the way he works and the way he goes about his business day in and day out, it definitely puts him at the top three. he should be in the top three. i'm sure he will be in the top three, i believe in the fans." if you recall, i kindly provided a little public service announcement, sharing some voter tips and things to look out for, in my Vote for Brantley blog. now i'm going to take a second to update a few of the points i previously made. i had mentioned that after a significant amount of time had passed in the voting process last year, a pop up notification reading "congratulations! you have voted 35 times from this email address" started appearing once you cast your final 5 votes with an email address. i have been voting with different emails on a weekly basis, so i can positively tell you that after the first four weeks, that pop up has not yet been implemented. however, the Thank You for Voting, "you have voted the maximum of 35 times" confirmation email is still in effect and it's the best way to reassure yourself that you got all your votes in. i also informed voters about how after one month last year, you could no longer vote with multiple emails in one day unless you used multiple web browsers. if you're like me and you are utilizing several email addresses to vote, then you're aware that since voting began on May 1, that restriction has not been an issue. could that change in June? possibly. i wouldn't rule it out. so if you begin to notice a problem when voting with a second email in one browser, simply use a different browser to vote. in two months of play, Michael has recorded 81 putouts and acquired 3 assists in 84 total defensive chances to yield a perfect 1.000 fielding percentage. prior to May, Michael played 50 straight games in the outfield without committing an error. add that to the 24 games he appeared in in May and he now has a 74-game errorless streak. he's still a ways away from his franchise record of 247 consecutive games without an error, but he's on the right track at least. among AL left fielders, Michael's 3 assists in 2017 rank tied for 3rd with Brett Gardner of the New York Yankees. Houston Astro Norichika Aoki has the most assists right now with 6, and Kansas City Royal Alex Gordon is 2nd with 4.
among all MLB left fielders, Michael's 3 assists rank tied for 3rd (with 3 other players). Ryan Braun of the Milwaukee Brewers also has 3, as does Marcell Ozuna of the Miami Marlins. among all AL outfielders, Michael's 3 assists rank tied for 7th (with 9 other players). among all MLB outfielders, Michael's 3 assists rank tied for 11th (with 15 other players). the current MLB OF assist leader is Nori Aoki. now let's break down the numbers. i am going to document his 2017 #s through May, the 3rd spot #s, and the PH #s, as well as the left field #s, the 3rd + left field #s, and overall outfield #s.
Michael played in 44 (of 51) games, 39 complete, in 2017 through May. he started and played left field in 43 games, completing 39 of those games, appearing in 44 total. he was a defensive switch into left field in 1 game for 2 innings after a PH appearance. he was subbed out defensively in 2 games after playing a total of 15 innings; 1 game after 8 innings because he had just been hit by a pitch on the right shin and also because the Indians were winning a blowout and he had done more than enough in the game, and 1 game after 7 innings because the Indians were winning a blowout and he had done more than enough in the game. he came in to PH in the top of the 8th inning in 1 game. additionally, he was subbed out offensively in the top of the 9th inning in 1 game and lost out on 1 plate appearance, but still played a complete game defensively because there was no bottom of the 9th inning. he got 4 scheduled games off. Michael was a PH in 1 game. Michael played in 39 complete games. feel free to leave comments about any of Michael's current statistics and/or what you want him to improve on going forward. also, be sure you're following me on twitter @clevelandgirl23 for daily news, stats, and facts about Michael all throughout the season! and if you want to be on my subscription list, you can sign up by entering your email addy in the box underneath the Blog Archive sidebar over on the upper right side of this page. then you will receive email notifications every time i post a new blog! don't forget to vote in my new polls as well! 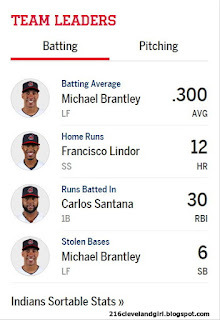 go on record with your predictions for what Michael's June batting average will be, how many HR and RBI Michael will have, and how many games the Tribe will win.